A woman of valor who shall fi nd? 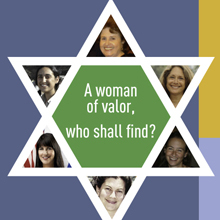 A partial answer is found in this new staged reading with music about 6 inspirationalSan Diego women.This year’s reading features portraits of Leslie Caspi, Shir Hebron,Audrey Jacobs, Jennie Starr, Judith Handler and the late Marla Bennett. All proceeds will benefi t: SCY High, Torah High, the Jewish Academy,and StandWithUs.